White top-stitching highlights these Sneeker-318 platform canvas sneaker boots by Demonia. 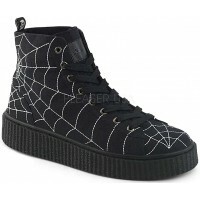 Black high top canvas Gothic sneaker for men or women features zig-zag buckled front detail with white top-stitching. Round toe with a 1 1/2 inch rubber platform heel, this unisex sneaker boot has a full inside metal zipper closure. All man-made materials with padded insole and non-skid sole. Made in men's sizes 4-13 medium width, see size chart to convert it to womens. Item Number: PL-SNEEKER-318 | Approximate Size (Inches): 12.00 wide x 14.00 deep x 6.00 high | Approximate Shipping Weight: 4.00 lbs.